Whether it’s excited yelling by fans or crying by K-pop artists, emotions run deep in K-pop. While some focus on obsessive emotional attachments and behaviors by fans, research shows that fans themselves describe a range of emotional responses to K-pop. 100 responses by 18- to 30-year-olds show that fans find K-pop to be a source of happiness, hope and motivation. These responses are part of a five-year study on international fans of K-pop housed at KPK: Kpop Kollective. 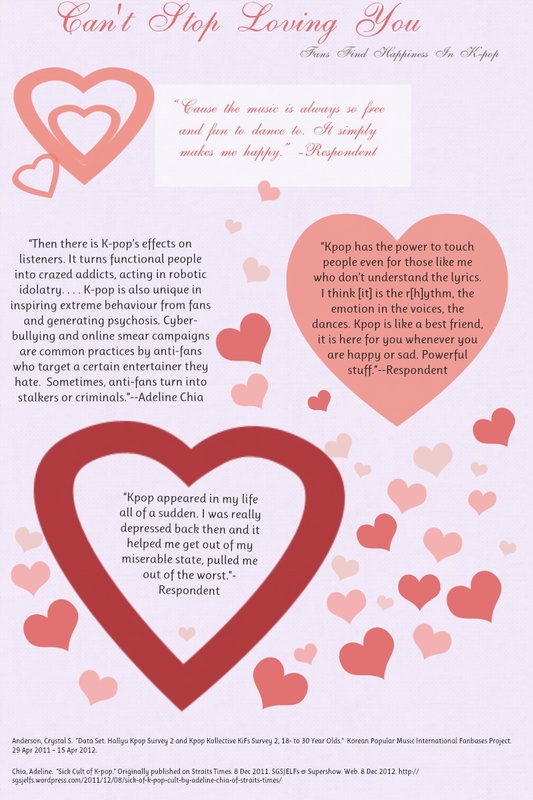 To view entire “Can’t Stop Loving You” infographic, click here. However, fans talk about the emotional appeal of K-pop in more positive terms. Some talk about overall emotions that go beyond the lyrics. One notes, “Kpop has the power to touch people even for those like me who don’t understand the lyrics. I think [it] is the r[h]ythm, the emotion in the voices, the dances. Kpop is like a best friend, it is here for you whenever you are happy or sad. Powerful stuff.” Another said: “The music is more touching and you can feel the emotions of the singers when they sing regardless of what genre.” Others link emotions to performances: “They sing and perform with passion and emotions, so even if you can’t really understand the lyrics you will get to know what it’s about by just listening. Kpop is not just another type of music it’s much more, that I can’t describe it with words” (Anderson). These responses echo what scholars have discovered about emotional responses to music that transcend cultural differences. In a study with Western listeners listening to Hindustani ragas, Laura-Lee Balkwill and William Forde Thompson find that it is possible for music to travel cross-culturally: “According to our model, this indicates that the psychophysical cues for joy, sadness, and anger were salient enough to enable listeners to overcome their unfamiliarity with culture-specific cues and to make an accurate assessment of the intended emotion. . . . That naive listeners demonstrated such a high level of agreement with expert listeners, who were deeply familiar with the culture-specific cues embedded in the music samples, is remarkable” (58). In other words, listeners from other cultures can identify emotionally with music of a different culture, and this may shed light on why global fans identify with K-pop emotionally. This emotional response runs the gamut. Many respondents describe how they find K-pop to be fun and happy. One notes, “Cause the music is always so free and fun to dance to. It simply makes me happy.” Another adds, “The songs are really refreshing, and listening to it puts me in a happy mood because of their lyrics and beats.” Other respondents link the happiness they feel from K-pop to their lives in general: “It always puts me in a good mood and makes me feel energized. Kpop sometimes can make you feel like your part of something bigger. It’s hard to explain but the feeling it gives you is great” (Anderson). Others related K-pop to more somber emotions. One respondent says, “Because it’s very different and the music touches something in me, I mean this is not superficial, there are feelings in every song, this could be happiness or some sad feelings.” Another notes, “When I listen to sad songs I find that it have feelings in it and it will touched me too.” One says, “There’s an upbeat to the music that sometimes make you want to dance other times depending on where you heard it from makes you sad” (Anderson). Some fans talk about how K-pop helps them through hard times. One respondent notes, “It was introduced to me at a hard time in my life and it has been the only music I listened to help me get through it.” Another says, “Kpop appeared in my life all of a sudden. I was really depressed back then and it helped me get out of my miserable state, pulled me out of the worst” (Anderson). Music can have the therapeutic effect these respondents describe. Annemiek Vink explains therapy methods, such as Guided Imagery in Music, which is “based on the assumption that the most appropriate music can be selected for healing purposes.” She further finds that the choice of music impacts the therapeutic results of GIM: “In all aspects, carefully selected music based on the person’s preference and personal background was far more effective than standard relaxation music” (153, 154). This range of fairly positive emotions challenges negative characterizations of their emotional expression. These responses come from adults rather than young teenagers, so it is less convincing to describe them as obsessive along the lines of Chia. She refers to incidents involving K-pop celebrities, but respondents speak about their emotions mostly in relation to the music. When they do comment on the artists, it is often in terms of the positive relationship they have with fans. One notes, “The singers are so dedicated to their music and their fans. They put their real emotion into every word” (Anderson). This emotional connection that some K-pop fans feel also translates into a discourse of protection, the desire to protect their group or artist from mischaracterizations. The Triple S Pledge encourages fans of SS501 “To support and shield them through hard times…To ignore rumors.” The same sentiments can be seen in the “Prom15e to Bel13ve and 10ve” philosophy held by some fans of Super Junior, which acknowledges every member regardless of current status or sub-group membership. These findings suggest that emotion plays a role in the attitudes and opinions of adult global K-pop fans, often in a positive way. Anderson, Crystal. Infographic. “Can’t Stop Loving You.” 14 Dec 2012. Web. Balkwill, Laura-Lee and William Forde Thompson. “A Cross-Cultural Investigation of the Perception of Emotion in Music: Psychophysical and Cultural Cues.” Music Perception 17. 1 (1999): 43-64. Vink, Annemiek. “Music and Emotion.” Nordic Journal of Music Therapy 10.2 (2001): 144-158. “Can’t Stop Loving You: Fans Find Happiness, Solace in K-pop” by Crystal S. Anderson is licensed under a Creative Commons Attribution-NonCommercial-NoDerivs 3.0 Unported License. Originally published on KPK: Kpop Kollective on December 14, 2012.